With Eurostar now running a three-hour service from London to Rotterdam, the city’s fortunes as a tourist hub are set to boom. So, get over there now and appreciate the fantastic views, great museums and excellent cocktails before the British stag parties take over, says Molly Quell. Only slightly smaller than Amsterdam by population, Rotterdam is the Netherland’s second largest city. It is home to the largest port in Europe, a fact which is partially responsible for its diverse population – more than half of the city’s residents have at least one parents who was born abroad. 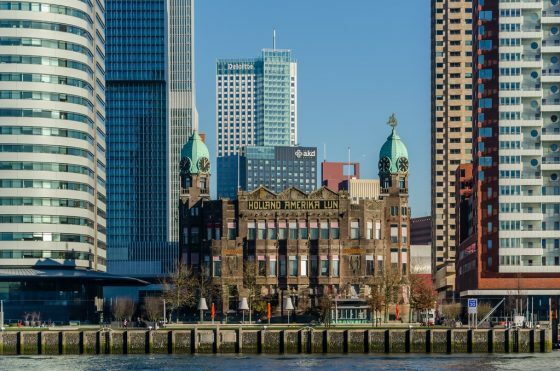 Rotterdam was granted city rights in 1340 but was, famously, nearly totally destroyed during World War II, leaving the city with a much more modern skyline than the capital. The city is too large to do a walking tour of everything, but you can easily get around with the city’s bus and tram system, but also the water taxi system. It’s fast, efficient and just a lot of fun. Go up the Euromast, go under (and walk over) the Erasmus bridge, check out the Witte Huis, snap a photo of the Kabouter Buttplug, marvel at the Cube Houses, grab a snack at the Markthal, wander down the Witte de Withstraat and see the Van Nelle factory. If you’re really up for a walk, walk the Fire Boundary Line, which demarks what parts of the city were destroyed during the bombing and subsequent fire. 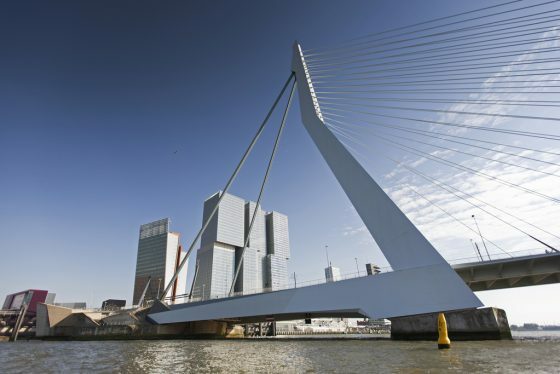 Rotterdam offers a wide variety of museums and the Netherlands Photo Museum is one of the best. The permanent collection contains the archives of over 160 historical and contemporary photographers. A lot of the works focus on the Netherlands, but the exhibitions often come from all over the world. If you can’t make it to the actual museum, you can view some of the collection online. You can book a tour, free on Sundays, and the museum is part of the Museum Card, so if you have that, entrance is free. 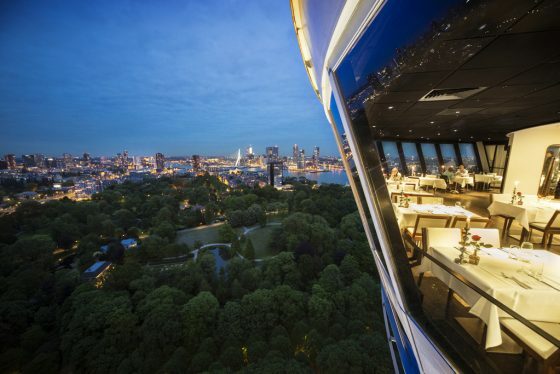 Like any good city these days, cocktails are on offer and Rotterdam is a good city. It’s got several options for a tasty beverage. The Suicide Club, near the central station, is an eclectic bar with a nice view of the city from their 8th floor location. Another choice would be the Aloha Bar, in a former indoor swimming pool. Or make an appointment with the Doctor, which can give you a prescription for anything that ails you. Take in a show at one of the many theater and performance venues in the city. There’s the Rotterdam Philharmonic orchestra, which performs at De Doelen, which is also the home of the International Film Festival Rotterdam. There’s lots of smaller venues as well, such as the Luxor, Theater Rotterdam and the Ro Theater. (The last two merged together under one name but in two separate venues.) The Luxor is, at the time of publication, showing Fiddler on the Roof while the Ro has Woof Side Story, West Side Story but with dogs. For something (even) more out of the box, try the Worm, which hosts everything from musical acts to live performances. Since you’re in the city with the largest port in Europe, you should take a good dip into the city’s maritime offerings. You can book a boat tour of the harbour, including the aforementioned port. Or if you want a shorter trip, take a water taxi around to the SS Rotterdam, the former flagship of the Holland-America line. You can wander around the ship and have a drink at the bar. The Maritime Museum, also a Museum Card member, highlights the port and shipping in general. And if you want to get out of the city a bit, check out the Maeslantkering storm surge barrier. It’s part of the Delta Works and you can get an explanation of how this engineering marvel keeps the country dry. You’ll even get to touch the barrier itself. You can easily find a full meal at the Markthal, the fairly recently opened food hall whose building has a unique profile. 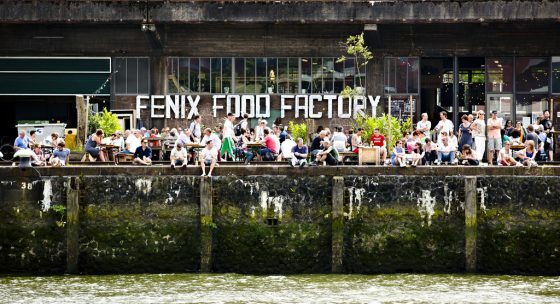 The same goes for the more hipster Fenix Food Factory. But consider just snacking on the various bites (the croquette stand at the Markhal and the butcher at the Fenix Food Factory are especially delicious) on offer and spending your limited meal times at one of the other delicious restaurants. V11, a converted English ship, will give British visitors a taste of home, including an excellent Sunday roast. Or the De Matroos en Het Meisje, a fish restaurant with a prix fixe menu. For an upscale option Parkheuvel boasts a Michelin star and a French-inspired menu. For breakfast, go to The Bazaar and get the full breakfast spread (and bring your appetite.) If you’re just looking for a coffee and a snack, try De Zeeuwse Meisjes. The fenix Food Factory also has a good coffee place. And, if you want something sweet, try Baker’s Dough, a cookie dough restaurant. The famous Hotel New York, which previously served as the launching point for the Holland-America line, is now a fantastic hotel with a lot of charm and a great restaurant and cocktail bar of its own. Get a room on the water side to enjoy the view. For a less expensive, but more adventurous option, Stay Ok offers rooms in Rotterdam’s famous cube houses, a slightly disorientating but architecturally interesting experience. Londoners, hop on the direct train and be there in three hours. For the rest of us the train is also a good option. Rotterdam is large but the city offers good local public transport, so you can get around by bus, tram, metro and even, as mentioned water taxi. 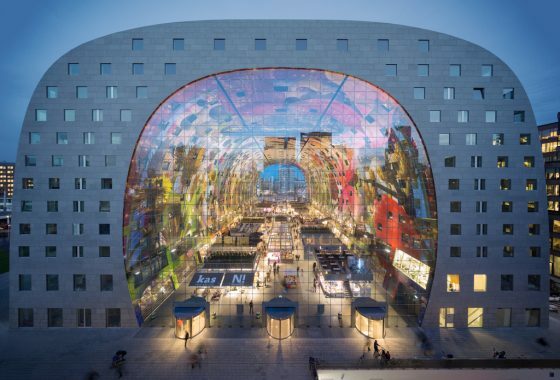 Many thanks to Suus Peet, my Rotterdam expert, who gave me a list of things to do and see in the city that will take me years to work through.